A fun, safe way to teach archery basics. Arrows feature plastic notches and rubber suction cups. Moistened suction cups stick to included target. 29"L bow, four 22"L arrows, arrow holder, target. Plastic notches and rubber suction cups on the arrows make this a fun, safer way to teach the basics of archery. When moistened, the suction cups stick to the included target, as well as other smooth, flat surfaces. 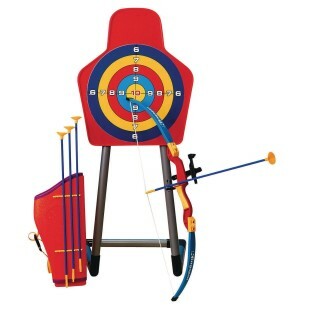 Set includes a 29"L bow, four 22"L arrows, an arrow holder and target, which stands about 38"H and a little over 16"W. Adult supervision required. THis is a toy. It is plastic and fairly small. The bow didn't come with any instructions and we just guesses how to rig up the string. it is pretty cool and fun for smaller children but it is a toy and probably not much fun for kids over the age of 10. First thing everyone wants to do is shoot arrows and see how gets highest score. Lots of fun and takes up little room. We bought this for our 7yr. old son and he loves it! A great price considering everything that comes with it. Used as part of a Medieval Gauntlet AWESOME children had so much fun and the set was so durable. I was very surprised the abuse this set could take. Merchant response: Thank you for your review. We sent your comments to the product manger.